OC Parks says pilot program to deter pinnipeds from docks will continue. DANA POINT ― A county-sponsored experiment to deter sea lions from docks at Dana Point Harbor appears to be working, according to officials at OC Parks. The program is expected to continue into 2017. 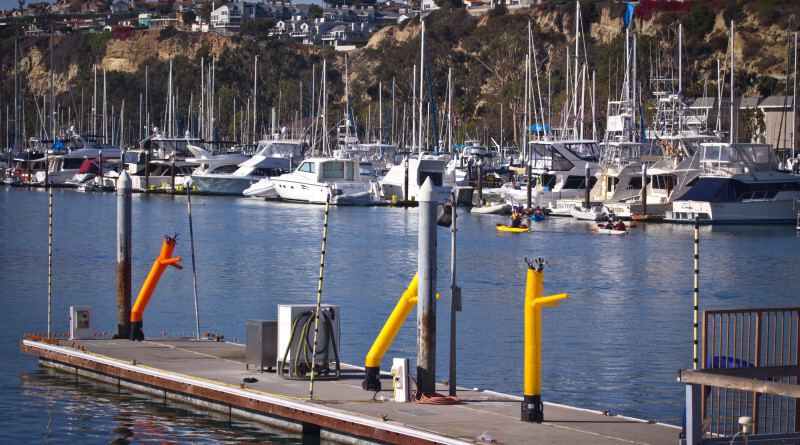 Air dancers were placed on various docks in Dana Point Harbor to deter sea lions since the beginning of summer. OC Parks has been looking at alternative ways to humanely discourage sea lions, or pinnipeds, from clambering and sprawling on boats and docks in the marina. Sea lions can cause damage, leave a mess and be rather aggressive when confronted. OC Parks expanded the air dancers’ pilot program throughout the harbor. 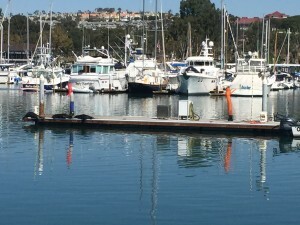 Air dancers at Dana Point Harbor met with initial success but soon became a less effective means to deter sea lions from the docks, so multiple obstacles might be implemented in the long run, O’Neil told The Log in September. The Log’s editorial team observed sea lions resting near an air dancer during a visit to Dana Point Harbor in mid-September. O’Neil said the air dancers, combined with barriers, have been working. Other methods used along with the air dancers include five gallon buckets filled with water as well as rails to deter sea lions from jumping on docks. “Lastly we also use the manual method … when receiving a report, a marina staff member physically turns a water hose on the sea lion. This is immediately effective but does not discourage them on a long term basis,” O’Neil said. A Dana Point angler told The Log the air dancers appear to be working, since he personally has not seen any sea lions on the dock with the air dancers where the sea lions previously lounged. He agreed that the sea lions do a lot of damage, make a mess and stink. However, he doesn’t necessarily want those air dancers on his dock saying they make a lot of noise, use a lot of energy and may be too expensive. With the change of season, there has been a “decrease in sea lions in the marina basins. It is anticipated that in the next 60 days, deterrence measures will be removed and redeployed if the sea lions return,” said O’Neil. The program to use air dancers as a deterrent is expected to continue. The number of air dancers may even increase if sea lions return next season, O’Neil told The Log. Seems like a great idea, I wish I had thought of it.